Discover Informix is coming to Thailand on August 7th (Tuesday), from 8:30 AM to 1:00 PM at Intercontinental hotel (Venue: Pinnacle 2,3), Bangkok. 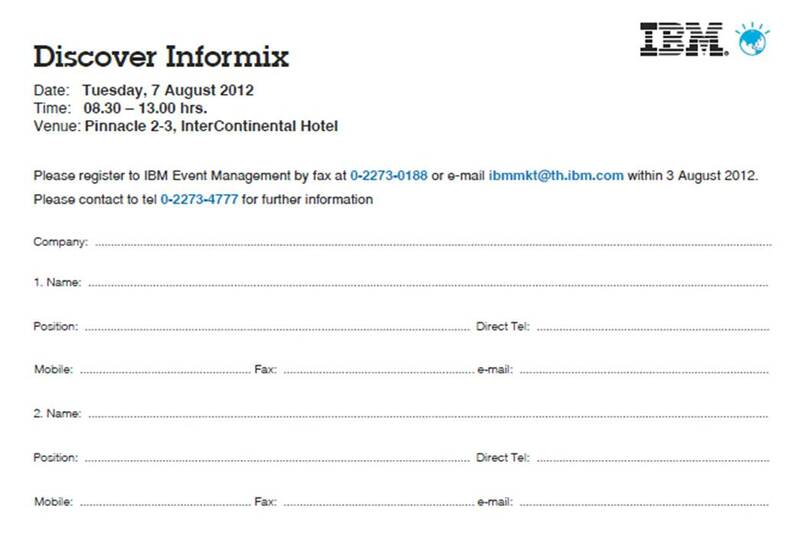 If you are around Bangkok during the week of 7th (of August 2012), please join us to for this half a day event and be a part of the largest Informix users gathering Thailand. We will be having some of the members IBM Informix leadership team and Informix subject matter experts to be present for this event in person, and they will be most happy to spend time with you to discuss on how IBM could help better achieve your business goals with Informix. The half a day event is filled with exciting session spanning from sessions focusing on IBM’s commitment to Informix, to session talking about Genero & Informix warehouse and Informix in the social media. Please register for this event by faxing the attached form to 0-2273-0188, e-mailing ibmmkt@th.ibm.com or by calling up 0-2273-4777 for more information. The registration form is appended below. Looking forward to meeting you in person during ‘Discover Informix in Thailand’. This entry was posted in Data, Data base softwares, Data Management, IBM, Information, Information management, Informix, Road Map, smart meter, smarter planet and tagged ASEAN, database, IBM, Informix, user group, warehouse by IBM Data Warehousing. Bookmark the permalink.